I entered a giveaway on a fellow blogger site. 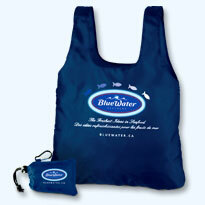 Over at A Motherhood Experience it was for a Blue Water Seafood tote and coupon for a free product of my choice! Alyssa has two children and is a stay at home mom facing all the obstacles that mothers face these days. There are loads of fun reviews and giveaways, great posts on life and parenting I'm sure you will enjoy.